On 30th November 2001 Gary Ridgeway was arrested for four murders linked to the Green River Killer. Spanning a 19 year career as the Green River Killer, Ridgeway was finally convicted of 49 murders and confessed to a total of 71, but is believed to have been responsible for the death of more than 90. Ridgeway’s apprehension was ultimately due to advances in DNA, but without the tireless work of Tom Jensen and the task force assigned to these murders, who kept the investigation going for almost 20 years, it’s possible that Ridgeway would never have been caught. In 2003, Ridgeway spent six months being questioned by detectives as part of his plea deal, with the promise of uncovering bodies the police hadn’t found. 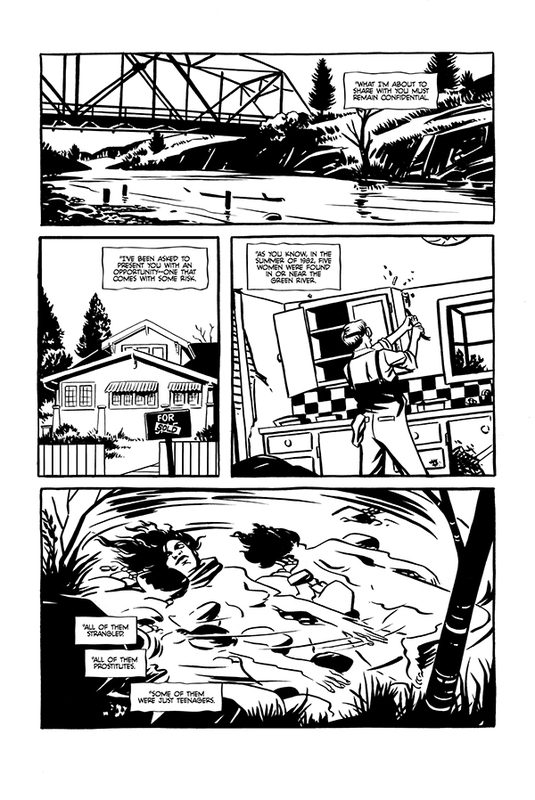 It’s this period which provides the main timeline for Jeff Jensen’s story, although ultimately the story is about his father and the toll that the almost 20 year hunt for the Green River Killer exacted on his life and family. 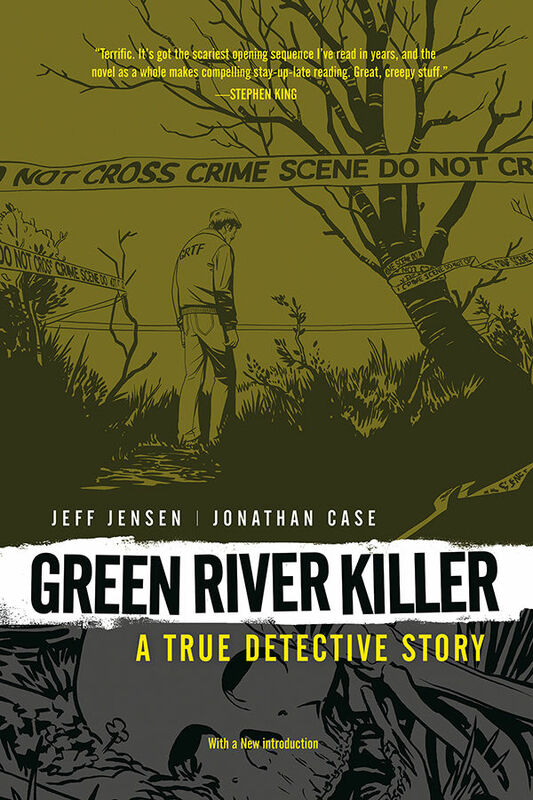 First published in 2011, this week sees Dark Horse releasing a new hardcover edition of Jeff Jensen and Jonathan Case’s intriguing glimpse into the lives of the people behind the capture of the Green River Killer. This book works on so many levels for me; there is tension, drama and some truly chilling moments. This is a fantastic true crime story that doesn’t focus purely on the serial killer, nor does it glorify his acts as is often the case in the media. Primarily this is the story of Tom Jensen’s strive to bring justice to Ridgeway’s victims and some form of closure to their families. There is a certain amount of dramatic license taken in the telling of this story but I felt throughout that this was done with the greatest of respect to the detectives working the case, the victims and their families, and it’s clear from Jeff Jensen’s narrative that his father is a man who has inspired great love and admiration from his family. The first chapter of this book nailed me to the floor. 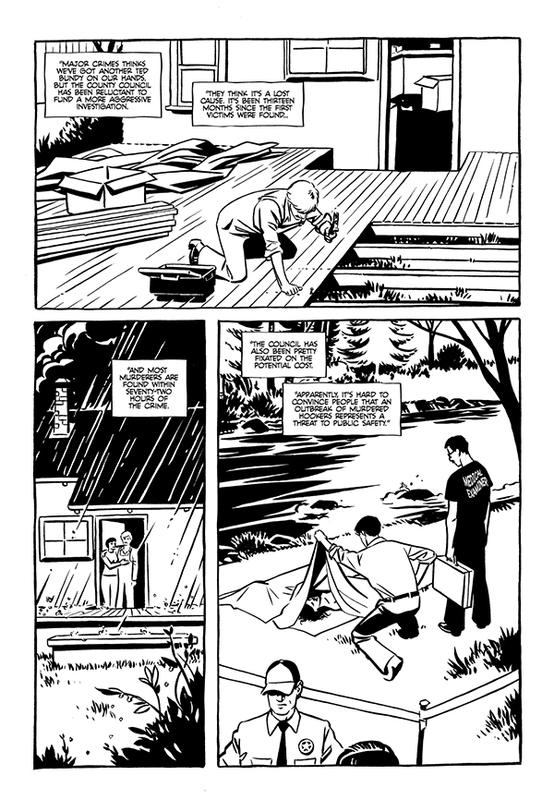 While I’ve read a lot about the Green River Killer over the years and I was already aware of this particular incident, seeing it on the page literally took my breath away. The blunt, matter of fact, almost casual manner in which what is believed to be Gary Ridgeway’s first attempt at murder is recounted is totally chilling. This is the point where Jonathan Case’s artwork takes what is already a fantastic narrative and really delivers something special. I try my hardest not to draw comparisons between artists as I feel that does the artist of the book I’m talking about an injustice, but if I didn’t know better I would be prepared to swear that this book had been illustrated by Charles Burns. 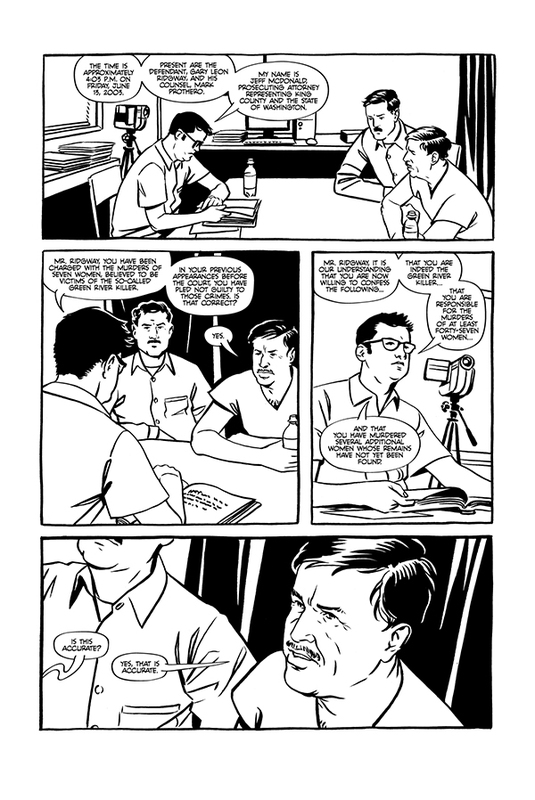 The stark, black and white style Case employs works very, very well in the illustration of this story and makes the impact of the less savoury moments of the story that much more powerful. This story spans five decades, and hops back and forward quite freely so it’s a testament to Case’s skill, particularly given the minimalistic style of his work, that it never becomes confusing and it’s easy to identify whether you’re in the ‘70s, ‘80s, ‘90s or ‘00s. I’m a massive true crime fan, and I spend a lot of time reading books on serial killers and the men that hunt them. There aren’t many graphic novels out there that deal with real serial killers, My Friend Dahmer being one of the few that immediately springs to mind, so it’s been great to be able to combine my love of all things true crime with my love of comic books. Overall, this is a great story, with great artwork and a personal investment in the telling of it that shines through, making it as heart-warming as it is disturbing and a 100% recommended read for any true crime fan.